Gartner Peer Insights is a free peer review and ratings platform designed for enterprise software and services decision makers. Reviews go through a strict validation and moderation process in an effort to ensure they are authentic. 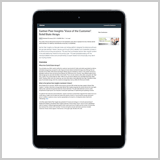 This document synthesizes Gartner Peer Insights’ content in the solid-state array market for the previous year. This peer perspective along with the individual detailed reviews are complementary to expert research and should play a key role in your buying process.